plaxo 88 this AGM pls come in big number and screw these guys. Chew must present a proper finanicial analsyis of situation instead of his regular technology garbage. abang_misai Impossible and unlikely to happen. All top posts are held by chew Chee Seng’s family members, wife, in laws. Livermore it will become explosive stock! Livermore DONT MISS THE BIG BOAT!!! Holycow accept your loss, go cut loss. there are many counter to play. diaz_flag yes continue to blow big big..
kelvinfixx Some advice for the CEO, axed most of your senior managers or even better yourself. Shutdown few loosing money products, that is not giving any result, better go private and return the shareholders money at 25 cent. Make the share higher before you get scold by your shareholders. commonsense This is a company that has been making substantial losses since FY15 (almost RM30mil). In FY18 alone, the total loss to shareholders was around RM8mil. Those investors that think that the company can suddenly turn to profit in FY19 might be having some wishful thinking. According to management the company’s turnaround plan will mainly be driven by the recent launch of its new online to offline to online system (o2o). However, given the company’s track record, investors would be safer to expect another loss year in FY19. MBMR is a direct proxy to Perodua via its 22.6% interest in the company. Valuation is cheap at only 6.1x PE based on FY18 profit of RM166mil. PB is low at only 0.7x BV. MBMR is expected to achieve a profit of RM200mil in 2019. At the current share price, the company is being valued at only 5.0x which is a lot lower than the industry average of 15x PE. 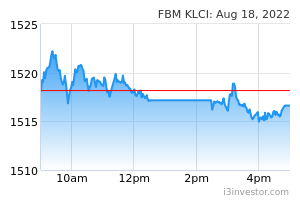 As an example, UMW (another company with exposure to Perodua) is currently trading at a PE multiple of almost 20x. WINNING Downtrend counter every year price drop see the 10 yearly chart. DONT TROUCH THIS COUNTER SURE DIE. diaz_flag where are all the mpay believer now? Andrew62 ManagePay Systems Berhad ('MPay' or the 'Company') - Acceptance of Letters of Offer by GCH Retail (Malaysia) Sdn Bhd ('GCH'), Jutaria Gemilang Sdn Bhd ('Jutaria') and Guardian Health And Beauty Sdn Bhd ('Guardian') from ManagePay Services Sdn. Bhd., a wholly-owned subsidiary of MPay, as the sole integrator to collaborate in facilitating all QR payment acceptance via 2D scanner or other banks payment devices.